When you look at Boatyard restaurant, there's not a lot it could do better. Prime, waterfront setting... Amazing view... Bright, stylish with great little lounge-like environments fit in neatly here and there. Boatyard could easily coast on its good looks and spectacular location, but coasting is just not in their nature, and besides, when you're catering to locals, you've got to give more than a pretty picture in a postcard. At least that's the way Konrad Jochum sees it. He brings high standards from his birthplace in Germany, his training in Chicago, and his experience and sense of adventure from years in Key West. The original designer of the Boatyard's menu, Jochum is now personally handling the kitchen, and he's stepped things up a bit in keeping with today's tastes. Konrad has made a lot of changes at Boatyard, but you'll still find Key West inspirations like Caribbean seasoned mahi, Shrimp & grits and guava glazed baby back ribs. But the real buzz at Boatyard these days is the Food Bar and sushi. Fresh fish at its freshest. Oysters cracked straight from the ice display, and killer sushi by Boatyard's gourmet sushi chef and Konrad's partner in crime... Dan Pettis. The Boatyard's wine list has been perfected by sommelier, Kat Meek, and she does a great job of offering wines to appeal to all wine appetites and budgets, and especially to those looking to expand their horizons. And, although most folks think of Boatyard as a 'summer place,' the truth is, when winter chill makes you want to warm up, Boatyard's Florida Room crackles and glows with a chic little fireplace and a mellow, cozy vibe. Upstairs is transformed into a warm little wonderland of twinkling lights and great friends hanging out at the bar. Cool weather is Boatyard weather for the local crowd. 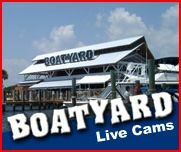 Boatyard restaurant: great on the outside... even better on the inside. Year 'round. On Grand Lagoon, in the heart of Restaurant Row.